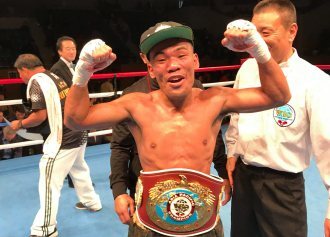 SanMan boxer Ben Mananquil (W17 KO4 L1 D0) won big on the road as he dominates Tenta Kiyose in Japan to bag the WBO Asia Pacific Bantamweight Championship belt. The classy Mananquil started slow calculating the moves of his opponent breaking down his defense and schooling him round by round. Mananquil saw his chance in the eighth round and dropped Kiyose to the canvass. The Japanese fought back like a warrior but was no match to the stylish Filipino who won by Unanimous Decision. “This win is so sweet because I won it far away from home. Kiyose was tough but I had him figured out. I am so happy to bring home this belt. I dedicate the win to my family, to my SanMan team and to my countrymen”, Mananquil stated. SanMan CEO Jim Claude Manangquil added another reason for celebration as his other wards Gaballo, Duno and Apolinario all won earlier in Manila. “This is another blessing. Another belt added to the SanMan belt collection. Indeed good things come to disciplined and hardworking boxers. Ben is a harwordking kid. He deserves this win”, Manangquil said.